^ Eatwell, Roger (2003). "A 'Spectral-Syncretic' Approach to Fascism". In Kallis, Aristotle A. The fascism reader. Routledge. p. 71. ISBN 978-0-415-24359-9. ^ Dator, J.A. (1969). "Measuring attitudes across cultures: A factor analysis of the replies of Japanese judges to Eysenck's inventory of conservative-progressive ideology". In Schubert, Glendon A.; Danelski, David Joseph. Comparative judicial behavior: cross-cultural studies of political decision-making in the East and West. Oxford University Press. ^ a b Davis, Otto A.; Hinich, Melvin J.; Ordeshook, Peter C. (1970-01-01). "An Expository Development of a Mathematical Model of the Electoral Process". The American Political Science Review. 64 (2): 426–448. doi:10.2307/1953842. JSTOR 1953842. Since our model is multi-dimensional, we can incorporate all criteria which we normally associate with a citizen's voting decision process — issues, style, partisan identification, and the like. ^ Stoetzer, Lukas F.; Zittlau, Steffen (2015-07-01). "Multidimensional Spatial Voting with Non-separable Preferences". Political Analysis. 23 (3): 415–428. doi:10.1093/pan/mpv013. ISSN 1047-1987. The spatial model of voting is the work horse for theories and empirical models in many fields of political science research, such as the equilibrium analysis in mass elections ... the estimation of legislators’ ideal points ... and the study of voting behavior. ... Its generalization to the multidimensional policy space, the Weighted Euclidean Distance (WED) model ... forms the stable theoretical foundation upon which nearly all present variations, extensions, and applications of multidimensional spatial voting rest. ^ a b Alós-Ferrer, Carlos; Granić, Đura-Georg (2015-09-01). "Political space representations with approval data". Electoral Studies. 39: 56–71. doi:10.1016/j.electstud.2015.04.003. 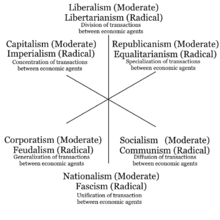 The analysis reveals that the underlying political landscapes ... are inherently multidimensional and cannot be reduced to a single left-right dimension, or even to a two-dimensional space. ... From this representation, lower-dimensional projections can be considered which help with the visualization of the political space as resulting from an aggregation of voters' preferences. ... Even though the method aims to obtain a representation with as few dimensions as possible, we still obtain representations with four dimensions or more.